“Life is short; eat dessert first”… at least once a year. In 1984, U.S. President Ronald Reagan declared July National Ice Cream Month. National Ice Cream Day is reported as either being July 14 or the second or third Sunday in July, depending on the source. Google claims it is the 20th this year. The date isn’t as important as the celebration, clearly. When we lived in Palo Alto, California, in the late 1990’s, we knew a family who had an annual “Ice Cream For Dinner” party. They invited us, and the entrance fee was one container of your favorite ice cream. I can’t remember what kind we brought, but I do remember the slight adrenaline rush at breaking the ultimate dinner rule; who sanctions that kind of meal?? It was loads of fun. Years later, we moved to the great dairy state of Vermont, which produces some of the world’s finest ice cream. I decided it was time to implement this tradition in our family: ice cream for dinner on National Ice Cream Day. We settled on the second Sunday in July, with some flexibility. This year we will be on vacation that day, so we are going to celebrate it this Saturday. We have invited some old friends and some new ones, and the ice cream-making began earlier in the week. We had a nice, cold dinner for 35 under the walnut tree. Enjoy you summer ice cream in whatever form it comes: maple creeemees at the local stand in Vermont, Ben & Jerry’s at your local scoop shop or grocery store, soft-serve vanilla in a waffle cone with rhubarb red sauce, homemade with chunks of your favorite fruit, or chocolate gelato from the food counter at Costco (which is really good, by the way). Here is the menu and the recipes for the homemade goodness. Ice creams: homemade Strawberry-Watermelon sorbet, Fresh Peach sorbet, Peach-Coconut ice milk, Maple Walnut frozen custard, Rose Petal and Pistachio ice cream, and Citrus Elderflower sorbet, with store-bought chocolate, mint chip, and vanilla, plus whatever the guests bring! Toppings: salted caramel sauce, homemade hot fudge sauce, Rainbow Sherbet Magic Shell (for the little guys), frozen crushed Oreos, waffle cone bits, sprinkles, Nestle Crunch clusters, whipped cream, peanuts, pecans, maple candied walnuts, blueberries, raspberries, and sweet cherries. Maybe some gummi bears. Make a simple syrup with 1 1/2 cups sugar, 3/4 cups water and 3/8 cup lemon juice. Barely boil, then cool in an ice bath. In a blender, crush watermelon and hulled strawberries (I usually use a little more watermelon than strawberries) to make 3 cups. Add fruit to cooled syrup, then proceed to freeze in an ice cream maker or in the freezer (stirring occasionally). Very similar in structure to the Strawberry Watermelon sorbet above. Make a simple syrup with 1 1/2 cups sugar, 3/4 cups water and 3/8 cup lime juice. Barely boil, then cool in an ice bath. Peel and roughly slice peaches to equal about 2 cups (about 4). Wash and slice (but do not peel) 2 more peaches. In a blender, crush all the peaches. Add 3 cups of this fruit mix to the syrup, blend, freeze. Whisk together 2 cups unsweetened coconut milk, 2 cups half-and-half (that’s a dairy product that is equal parts whole milk and heavy cream, with a fat content between 10.5-12%), and 2 cup sugar. Peel and dice a peach. Freeze the mixture in an ice cream maker, adding peaches at the last minute. Or put the mixture in a container (including peaches) and place in the freezer, mixing every few hours until frozen. This one is a labor of love for me. 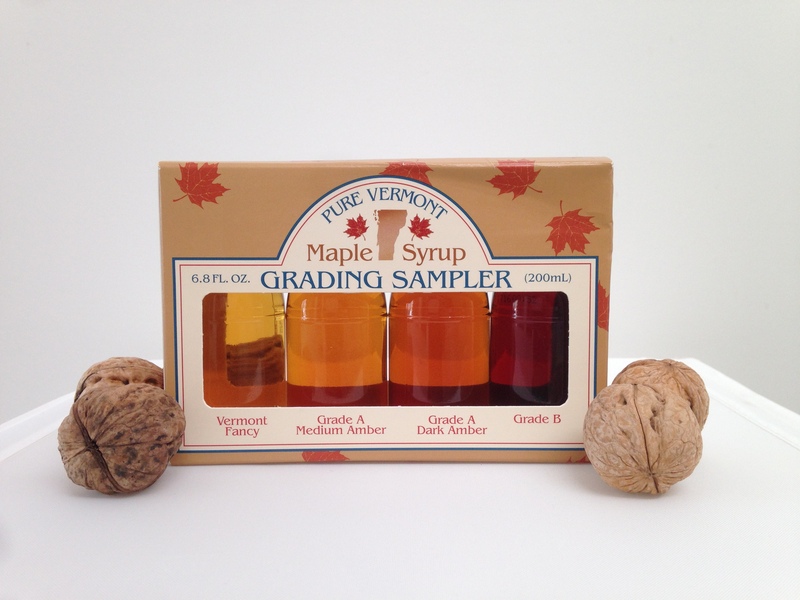 When we lived in Vermont, I tapped the trees and made this one from my own syrup. I had to buy the walnuts. Now that we live in Utah, I have to buy the syrup, but I get to use my own English walnuts. It’s all good. The first time I made this one, I took some to our next-door neighbors. They were modestly complimentary. I thought that maybe I had done okay. But the next summer, they asked if I would please make it again, and could they invite their best friends to come over, too? I knew I had something good at that point. As we each dipped into our little glass bowl of this rich dessert, I looked at these four old-time Vermonters for feedback. It was just like the dinner from Babettte’s Feast; their eyes were the only clues to their silent feelings. It was the highest compliment. Combine the milk and cream in a medium saucepan. 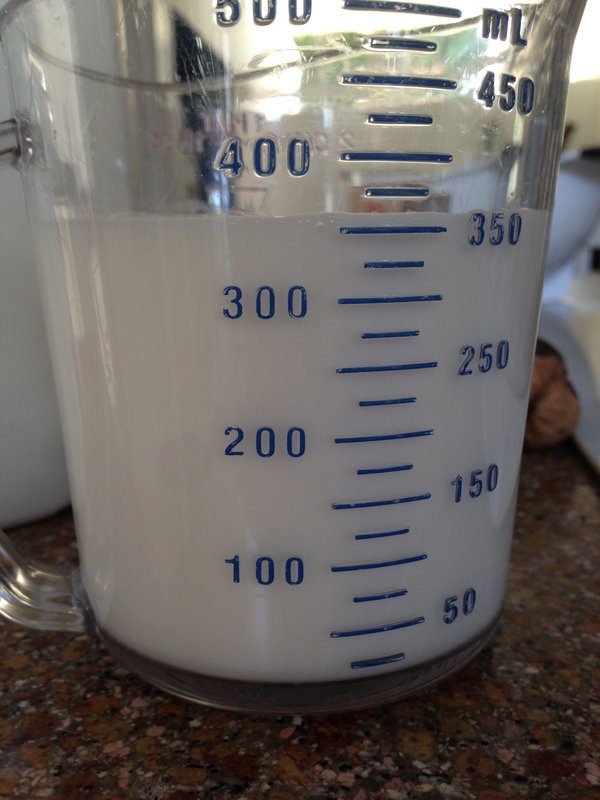 Split the vanilla bean, scrape out the seeds, and add both the seeds and the pod to the milk. Bring it to a slow boil over medium heat, stirring frequently, reduce heat and simmer for 30 minutes, stirring frequently. Combine the eggs, egg yolks, sugar and 1/4 cup of the maple syrup in a bowl. Using a hand mixer on medium speed, beat until the mixture is thick and pale, about 2 minutes. In a very hot frying pan, toast the chopped walnuts, brown sugar, and 2 Tablespoons of the maple syrup for a few minutes. Be careful not to burn it. Remove from heat and allow to cool. Break up any clumps. 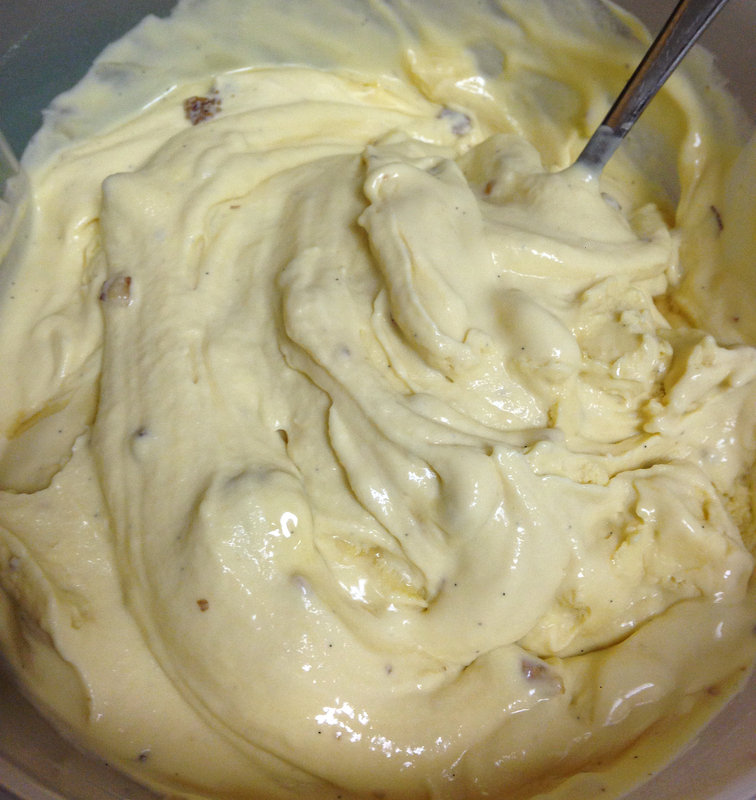 Run the custard mixture through an ice cream-making machine, adding the nuts and final 2 tablespoons of maple syrup at the last minute. Serve soft or freeze completely. Heat the cream and milk over medium heat, stirring, for 8-10 minutes. Do not quite boil. In a bowl, mix together the egg yolks, sugar, vanilla and rose water. Add 1/4 cup of the hot milk to the eggs, stirring as you pour so the eggs won’t curdle when heated. Remove from heat and stir in the rose jam and syrup until all melted and blended. Cool completely either in an ice bath or the fridge overnight (with a sheet of plastic directly on the surface). Pour the cooled cream into the ice cream maker till done. 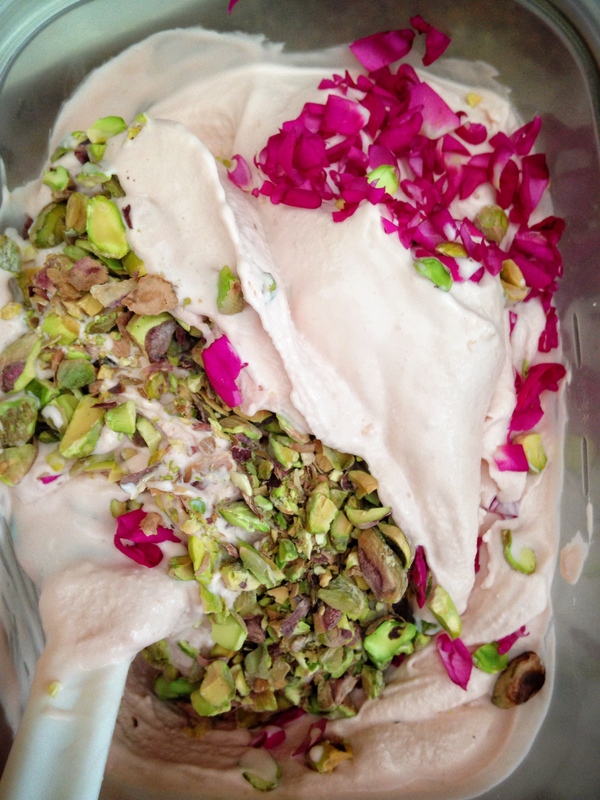 Pour into a container and stir in the rose petals and nuts by hand, then fully freeze for 6-8 hours. 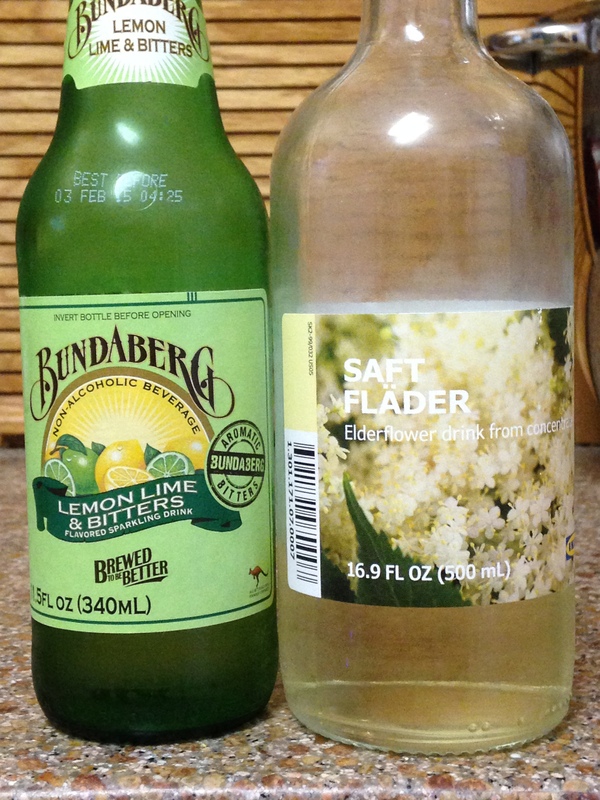 Bring 1 340ml bottle of Bundaberg Lemon Lime & Bitters soda and 3/4 cup sugar just to a boil. Cool syrup. Juice and zest two large lemons. Add pulp and zest back into juice (but not seeds). Mix 150 ml (just over 1/2 cup) elderflower saft (concentrate) and 1 3/4 cup water into the lemon juice. Combine all mixtures, pour into a container and freeze overnight. In the morning, mix it up with a spoon and return to the freezer for a few more hours. Or freeze in an ice cream maker. Makes about a quart/liter. A bright green dairy-free frozen treat. Totally delicious!! I know what you’re thinking. “You do not like it. So you say. Try it! Try it! And you may. Try it and you may, I say!” I had one friend ask if it was kiwi-flavored. I think it tastes like a banana smoothie. Place everything into a powerful blender in the order listed. Blend on “ice cream” mode or until totally smooth and blended. 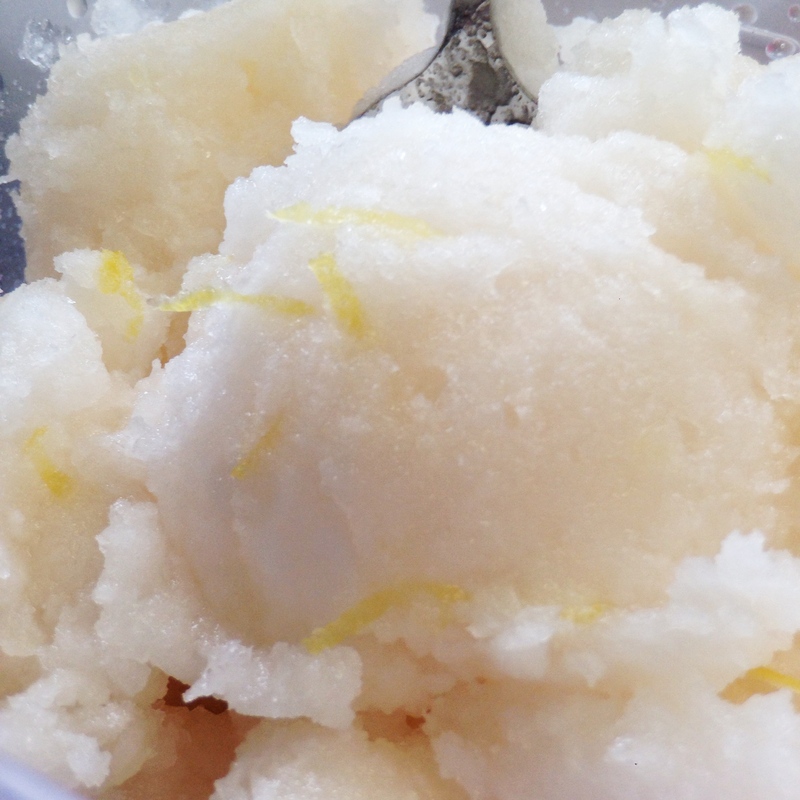 Pour into a container and finish freezing in the freezer for several hours. Sift the dry ingredients together several times. The smoother this mix, the better the fudge. In a saucepan over medium heat, heat the wet ingredients until butter and chocolate melt. Add dry to the saucepan, bring to a boil, whisking constantly. Reduce heat and cook for 5 minutes, stirring occasionally. Serve warm. This entry was posted in Family Life, Holidays, Life, Recipes, Summer and tagged almond milk, citrus, coconut, cooking, custard, dessert, elderflower, family, holiday, ice cream, ice milk, maple, peach, pistachio, rose, sorbet, spinach, strawberry, walnut, watermelon by Maren. Bookmark the permalink.